(Phys.org)—A team of researchers from several institutions in France and one in Germany has found that emperor penguin huddles are more complicated than has been thought by many in the science community. In their paper published in the journal Animal Behaviour, the team describes their study of the penguins over three separate breeding seasons and what they learned by looking at video of penguin huddling. Male emperor penguins huddling to keep themselves and eggs laid by an absent mate warm, has been made famous by the documentary March of the Penguins—they stand, seemingly stoically against the onslaught of bitter cold and frigid wind. Their actions seemed all the more interesting when it was learned that they shift about, moving members from the outside edges towards the center to share the burden of keeping warm. Now it appears that such images may be only part of the story. In this new research effort, the researchers discovered that penguin huddles don't last very long because the penguins actually get too hot. 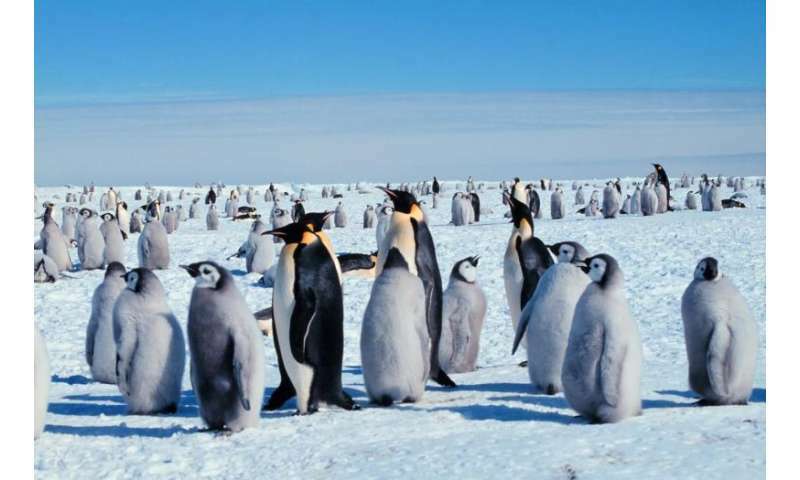 The team studied approximately 3000 emperor penguins living and huddling in Antarctica's Pointe Géologie Archipelago colony over the years 2005 and 2006 and then again in 2008. In studying the video recordings they made, they discovered that huddling typically only lasted on average from twelve minutes to a few hours, and the average length of time an individual penguin spent in a huddle was just 50 minutes. They also found that temperatures inside the huddle could get hot, sometimes reaching nearly 100°F under certain conditions. What's more, they discovered that it typically only took action by a single member to cause the huddle to disperse, and that the individual was generally one on the outside edges. Backing up their theory that it was excessive heat that caused the huddles to disperse, the team found that soon after separating, a haze of warm air was released, and some of the penguins ate some snow, apparently attempting to cool off faster. The team reports that they were surprised to discover that it was generally an outlier that instigated the breakup of huddles, but suggest that may have been because those in the center were trapped by the others around them. Social thermoregulation is a cooperative strategy in which animals actively aggregate to benefit from the warmth of conspecifics in response to low ambient temperatures. Emperor penguins, Aptenodytes forsteri, use this behaviour to ensure their survival and reproduction during the Antarctic winter. An emperor penguin colony consists of a dynamic mosaic of compact zones, the so-called huddles, included in a looser network of individuals. To maximize energy savings, birds should adjust their huddling behaviour according to environmental conditions. Here, we examined the dynamics of emperor penguin aggregations, based on photo and video records, in relation to climatic factors. Environmental temperature, wind and solar radiation were the main factors contributing to huddle formation. The analysis of individual movements showed that birds originating from loose aggregations continually joined huddles. Sometimes, a small number of birds induced a movement that propagated to the entire huddle, causing its breakup within 2 min and releasing birds, which then integrated into looser aggregations. Different parts of the colony therefore appeared to continually exchange individuals in response to environmental conditions. A likely explanation is that individuals in need of warmth join huddles, whereas individuals seeking to dissipate heat break huddles apart. The regular growth and decay of huddles operates as pulses through which birds gain, conserve or lose heat. Originally proposed to account for reducing energy expenditure, the concept of social thermoregulation appears to cover a highly dynamic phenomenon that fulfils a genuine regulatory function in emperor penguins.